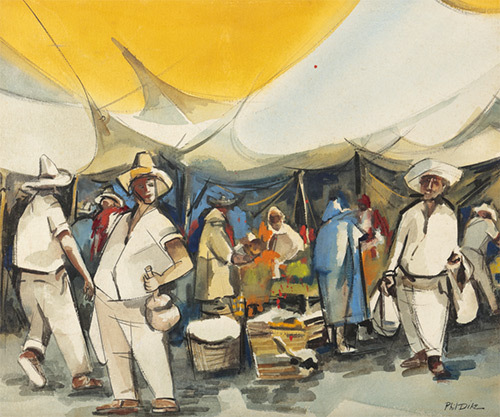 Known as the intellectual and artistic leader of the California watercolor artists, Phil Dike was strongly influenced by avant-garde* painters Georgia O’Keeffe, John Marin, and Charles Burchfield. He was born in Redlands, California, and was exposed to art from his childhood because his grandmother, Eliza Twigg, was a painter. He first studied art in high school with Mary Louise Arnold whom Dike later described as so sombre and dressed in such heavy shoes that she looked “like Washington crossing the Delaware” (Edan Hughes). In 1924, he began his art education at Chouinard Art Institute* in Los Angeles, and in 1928 went to the Art Students League* in New York where he studied with Frank DuMond and George Luks. He traveled throughout Europe and studied for a year, 1930, in France at the American Academy of Fontainebleau, and exhibited at that time at the Paris Salon. He returned to Los Angeles where he taught at Chouinard’s for twenty years and also worked in the fine art department of Walt Disney Studios where from 1934 to 1944, he was Color Coordinator and worked on animated classics including Fantasia and Snow White. He was the first artist to put color into Disney animations*. From 1950 to 1971, he was on the faculty of Scripps College and Claremont Graduate School. He first went to Arizona in 1931 during the Depression and returned to paint copper mining scenes, where he depicted a thriving copper mining industry of both open pit and underground mines. Some of his locations were Jerome, northwest of Phoenix, and Globe and Morenci east and south of Phoenix. His paintings can be found at The Metropolitan Museum of Art in New York, the Butler Institute of American Art in Youngstown, Ohio and the Pasadena Art Institute in California. He also did work in ceramic tile including the entrance of the St. San Antonio College Fine Arts Center and the pool area of Scripps College, and the chapel of Claremont Community Congregational Church.